My question regards the creation of new 'information'. First is this 'genetic' information that is not produced? Are you saying that no new genetic information is ever produced by natural means? Yes. We are saying that no new innovative genetic information of the type needed for even the smallest advance in so-called molecules-to-man evolution is ever produced by natural means--at least not that has ever been observed. Random processes appear to destroy information just as the scientific laws of information tell us. No evidence has come forward of any new genetic information ever being created by natural means. Mutations often result in changes to informaton, but information is lost or distorted, but no examples exist of genetic information being increased or created by natural means. It is illegitimate to use Natural Selection to support Evolution. Natural Selection supports a young Earth and a Creator. See: Is Antibiotic Resistance Really Due to Information Gain? Second: Practically every pro-evolution site claims that evolution does produce new genetic information. So I would appreciate the basis for your statement that no new information is produced. First, see the chart near the top of this page. This may help. Read: Without Excuse by Werner Gitt, a description of the scientific Laws of Universal Information. The basis for the statement that no new information is produced is plain in the frustrated Evolutionist quote below. There are many examples of claims by Evolutionists of proof of Evolutionism. Some of these false claims are the claims that "a new example exists that is evidence that mutations can generate an increase in information." Each time a claim is made, that claim must be tested by science. Observation and logic are applied. Since Evolutionists seem to be incapable of challenging any claim in favor of Evolutionism, it falls on the Creationists to apply science and see whether or not the claim is valid. To date, no claim has been valid. (Examples of false claims) It may be possible that a random event could actually add information, and it also may be possible that a random event could even add information that would be beneficial. The odds against this are very extreme. Even if an example were to be found, which has not happened, the finding of an example would not verify Evolution. We can see that the possibility of adding information is remote. The possibility of improving design by random process is insanely remote. The overall trend will always be downward. That is what science tells us. Every scientist knows this, but the social pressure and economic sanctions against any scientist who does not embrace and defend Evolutionism at all costs are so great that scientists tend not to even want to notice that their thinking is inconsistent and muddled. It is much more comfortable to just keep going with the flow. In the same way, it is also possible that random events could add to the order and potential energy in one part of the universe. However, that would result in a reduction of order and potential energy in another part of the universe. The Second Law of Thermodynamics has never been refuted. No exception to this law has ever been shown. (Read More) The laws that regulate information apparently follow the same pattern as The Second Law of Thermodynamics. The Evolutionists will tell you a half truth about the Second Law of Thermodynamics. The Evolutionists will put forth the half truth: "The Second Law of Thermodynamics only applies to isolated systems, so it's not relevant to evolution, because the Earth is an open system." This is a clever lie. Here is the part of the truth that they are withholding: the Second Law of Thermodynamics was derived using theoretical isolated systems, but it applies to all systems, and can only be overcome locally and temporarily in open systems when stringent conditions are met. Not only that, but we are not talking about the Earth. The Earth is just a subsystem of a much larger system called the Universe. The Universe is an isolated system. Evolutionists claim that Evolution took place in this isolated system, but the Second Law of Thermodynamics tells us that their story is a myth. The following is quote of a lie that was given by an Evolutionist. "No matter what example is offered as evidence that mutations can generate an increase in information, Creationists naturally have rationales for regarding that example as a case of loss of information. 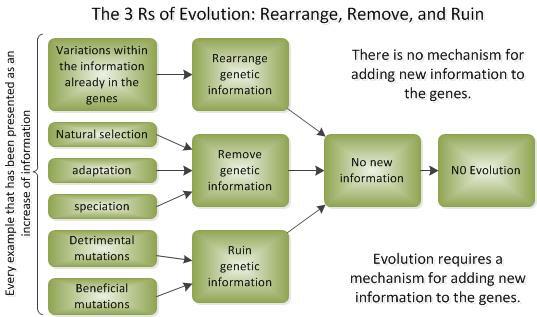 But every time Creationists "prove" another mutation to be an example of information loss, they add one more item to the list of biological changes which don't require a gain of information! If this pattern continues, Creationists will eventually "prove" that no biological change requires an increase in information; hence, they will have destroyed their own argument." Since we cannot find any evidence of mutations generating an increase in information, we Evolution-Believers must present lies in which we claim that information has been added when in fact information has been removed or swapped or duplicated or moved around. We resent the fact that Creation-Believers logically and rationally point out the fact that information has not been added. Therefore we Evolution-Believers would like to float an implication that even if we were able to find a case where information would be added we think that the Creation-Believers would rationalize (that is reason in a way that is not consistent with sane, logical, and rational thought) and say that an actual increase in information did not occur. We would like to imply that Creation-Believers would not be able to admit it even if we were to ever find any example of information being added to anything by random chance. (Of course, no such example has actually been found.) And now, we would like to also deceptively imply that all or most biological changes do require gain of information and that Creation-Believers are actually not understanding this and that they are using up all the possible biological changes (and we would like to falsely imply that these all required an increase in information even though no such increase in information has ever been observed) so we, the Evolution-Believers, now claim to have won this argument. This quote by the Evolutionist is very clever and deceptive in a very illogical sort of way. There is more that is not stated here, but it is implied and must be addressed. The presentation of arguments like this from Evolution-Believers holds an underlying false assumption. Actually, the false assumption is a bit of loopy logic. Now, we all get caught in loopy logic from time to time, so it is understandable that Evolutionists would also do this. And this is especially true given the tremendous pressure Evolutionists are under to conform to Evolutionism. Here is the loopy logic: "If we could just prove that Evolution were at all possible by the furthest stretch of the imagination, then we would have proved that Evolution is not only possible but also that it took place and that would prove something about God or about what God did or did not do or about the age of the Earth or about the accuracy of the Bible or about all the above. The reality is that Evolution remains a scientific impossibility. However, even if it were possible that Evolution could have happened, that would in no way prove that it did happen. That would be loopy logic like this: "If x is possible, then x is a possible cause of y so if x can be shown to be possible, then this is proof that x caused y." For example, just suppose that you are arrested for stealing a car. The car was put into a garage five years ago and after five years, the owner looked in the garage and the car was gone. The logic given to the judge is this: "You are capable of stealing the car and you have not always been where witnesses could observe you at every moment over the last five years, so it is possible that you could have stolen the car and that proves that you did steal the car." You would protest that this doesn't prove any such thing. Yet, the whole Evolutionistic political force is built on this type of logic, always proposing some new supposed proof. The proof is never proof that Evolution happened but some proposed hope of proof that Evolution could be possible. Then, another scientist who is not tied to the Evolution money stream will study the supposed proof and show it to be bogus. To pre-suppose that "proving Evolution is possible also proves that Evolution happened" is a deceptive lie. Evolutionism is a religion that pretends to be science. It has always been deceptive. When one lie is uncovered, it will hang onto the lie as long as it can and then, finally, move on to other lies unabashed. There are many ways to pretend. One way is to say that Science = the molecules-to-man evolution conjecture / fabrication. Another is to claim that the molecules-to-man evolution conjecture / fabrication = Science. It is a conjecture, a fabrication. It isn't even a scientific theory. Other variations include claims that Biology depends on Evolution, or claims that Biology is Evolution, or claims that Evolution is Biology. These are not proof of anything but rather the placing of a label on something that is not based on observation and logic. That is not to say that observation and logic are the supreme way to knowledge. Such a statement would be scientism--another religion and a self-refuted religion at that. People who won't acknowledge God or listen to His Voice will only accept those things that conform to the arbitrary assumptions of Naturalism, materialism, and uniformitarianism. Then they claim that these arbitrary assumptions are facts. Naturalism claims that God does nothing and that there is no God. Materialism claims that there is no God or spiritual realm. Uniformitarianism claims that there was not creation and that there was no violent worldwide flood, as the Bible and numerous other historical accounts record. Whatever they observe that does not conform to this complex filter is censored. The way that it is censored can take several forms. The ungodly may boldly proclaim that, though the data appears to support God's version and refute the version of the ungodly, yet it still must be interpreted to mean just the opposite of what it does mean. A backup method that ungodly people use is to prophecy that in the future, science will be able to explain what they see as an anomaly. If that fails, they will hide the data, set it aside, or lie to keep the public from knowing the truth. The data clearly demolishes the story of the ungodly and clearly supports the reality of the Creator God, His Bible, and His abiding Presence in His people. When confronted with the obvious, a closed-minded ungodly person says, "I can't understand it." They are willingly ignorant because they refuse to hold God in their knowledge. The reality is that these people, for whatever reason, don't what to know the Creator. They don't want to truly know Jesus, their Creator. Home > Meaning > Christian Witness > Answers for Witness > Stories Versus Revelation > Creation, Flood, Etc. > Creation v. Evolution > The Problems with Evolution > Q&A No New Information?